Please note: This will be the last time I mention this - some maybe happy to know the amount of times I've mentioned it. 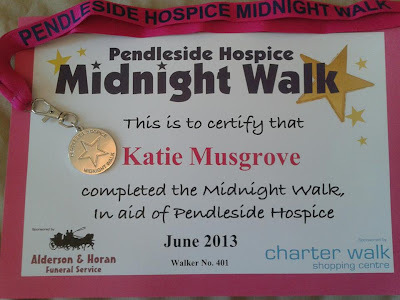 Last night / this morning was the start of the midnight walk where me, my mum, sister and her friend walking eight miles to raise money for Pendleside hospice. The turn out was a huge success, we couldn't quite hear the radio DJ from 2BR over the noise of everyone but me, my sister and mum all heard different numbers of the turnout (me: 1004, mum: 1040, sister: 1400) it's one of them we heard the thousand and a four lol. There were stalls with accessories to make the walk fun and for us to stand out, like flashing bunny ears and more. I got a flashing butterfly head band. They were decent music, a Abba tribute band then someone from the local leisure centre got us warmed up with a mixture of different exercises. We then had a minute silence released some balloons and off we went. I'm happy to report me and my mum finished the walk in 2 hours and 10 minutes. Unfortunately we lost my sister and her friends along the way and ended up waiting for 20 minutes for them to come along to the finish line. The last mile and half I did have to walk in just socks - My trainers were brand new never worn and I didn't have time to break them in which resulted in my having HUGE blisters on the back of my heel. My legs are a little achy and I'm going to have a long soak later to ease the pain. 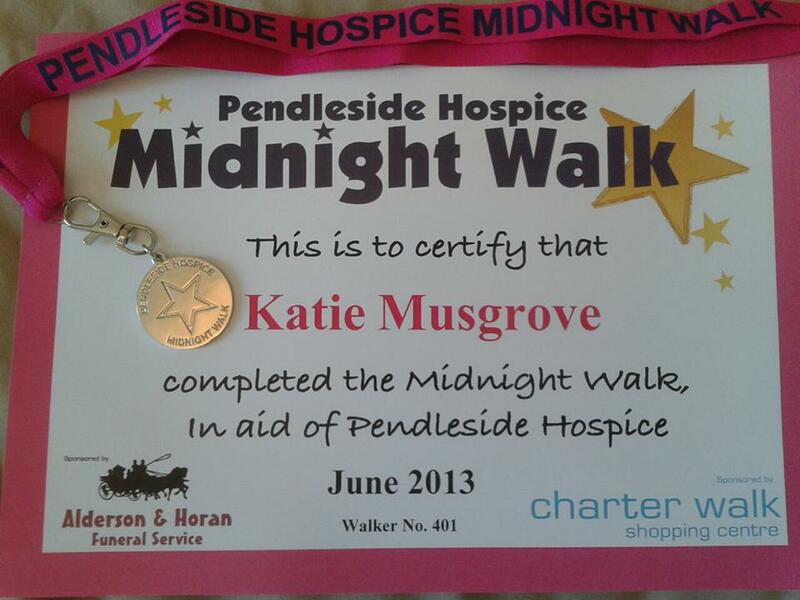 We were rewarded with a medal and a certificate on the return to the finish line. I just want to take this moment to say how proud I am of my mum, she was seriously ill in hospital at the beginning of the year, she then was diagnosed with severe asthma she didn't allow this to affect her chances of finishing and pushed through right until the finish all in the name of charity. Please, please, please if you can. All info can be found on my Just Giving page. Well make the most of the rest today! Maybe a footbath in some lavendar oil and tea tree would help, if you have them, with the blisters as they are natural anticeptics and a warm foot bath would feel nice! Congratulations hun! I always get blisters on my heels no matter how many times I wear shoes or trainers. You've done soooo well, your mum must be proud of you and your sis, xoxo. I wish I had the compeed free kit from bzz agent, I always have problems with my heels :(, xoxo.